I’ve seen lately many articles with must have items in your office drawer, some of them I completely agree with like oil blotters but a hair straightener seems a bit over dramatic. 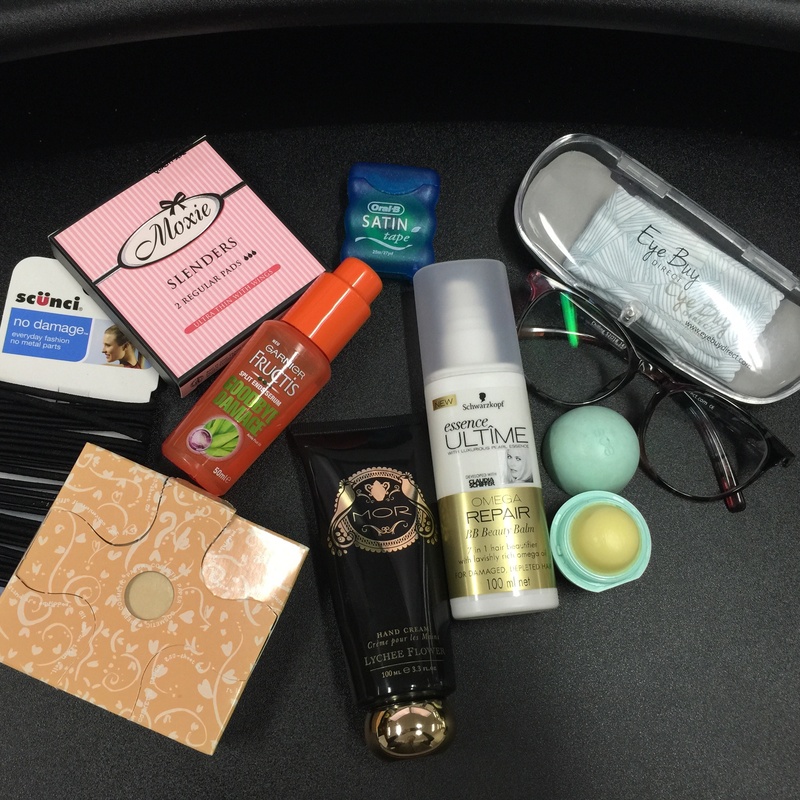 Here is what actually lives in my office desk drawer, these items forever live there. So don’t mind the fact there isn’t any makeup, all my makeup comes and goes with me. It’s a 2 pack in really cute packaging. Ladies I don’t need to express why it is so important to keep things like this at your desk. I know that I have a convenient store across the road from my office but in an event of an emergency that store isn’t convenient enough. I have long hair and hair elastics are an everyday necessity for anyone with medium to long hair. Scunci Hair elastics are the bomb! They don’t have the metal bit that gets stuck in your hair and pulls all your hair out. I have astigmatism, pretty much my eyeball isn’t round but more football. So everything at a distance is kind of blurry and wavy. I don’t need glasses to see see and I mean that in the sense that my prescription is so low that I don’t need glasses to see. I wear them when I’m working or studying so that my eyes don’t get fatigued. I really recommend everyone get glasses from EyeBuyDirect they are really affordable. My new love is the one above and the frame only cost $20! My dental hygiene could be improved by brushing my teeth after lunch. I haven’t gotten to that level yet, but I’m a strong believer in flossing. I can’t stand food stuck in my teeth. Here’s a no-brainer tip for easy flossing: Try storing floss in your car, in your bag or in your office drawer. Flossing helps prevent gum disease and cavities and NOT flossing is the leading cause of tooth loss in adults, it makes you wonder why more people don’t do it. I’m in love with EOS their lip balms are so cutely packaged. EOS lip balms have been around for quite a while now, and they have so many celebrities using them including Kim Kardashian, Miley Cyrus, Christina Aguilera and Kylie Jenner… just to name a few. Their lip balms smell amazing and they have this tingly feeling that last for a little bit that I also am a big fan of. Plus who doesn’t have lip balm with them because I hate the feeling when you don’t have one, all you do is keep licking your lips but it doesn’t help. Everyone should always carry around hand cream with them. You can never moisturize your hand enough. MOR Lychee Flower is amazing absorbs well and is perfectly sized for your desk drawer or handbag, plus it smells amazing. Their whole range smells AMAZING! The packaging from my photo to the product photo does differ because MOR recently released new packing designs. I have so many hair products that I have stashed everywhere because I dye my hair so often my hair is DEAD. All these products help give my hair that appearance that I have my sh*t together. Garnier claims that Fructis Goodbye Damage Strengthening Hair Oil can Reverse 1 year of damage in 1 week! Of course this is base on their T&Cs but when you start using this product you can understand why they make this bold claim! And my God does this product just smell delicious! Essence Ultime Omega Repair Beauty Balm isgreat . Like all of the Schwarzkopf range this product smells nice andsweet, and isn’t too strong so you don’t have to worry about it but your hair is will still be nice to smell. The pump works great to get just the right amount. So ladies what do you have in your office drawers? I love lip balms eos!